Establishment date of provisional gov't to be changed to April 11. April. 14, 2018 09:58. by Won-Mo Yu onemore@donga.com. 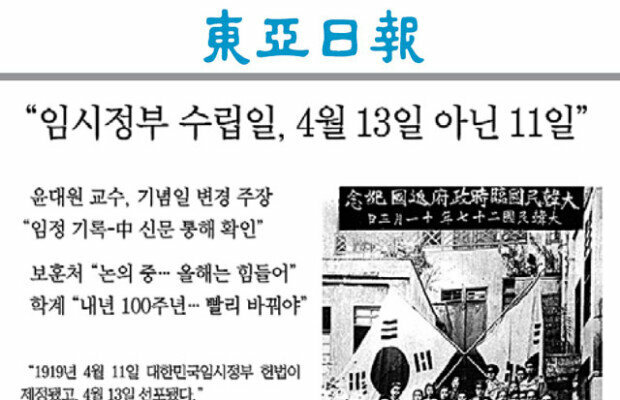 The foundation of the Provisional Government of the Republic of Korea in Shanghai will be celebrated on April 11 every year starting from next year, the centennial of the establishment of the provisional government. Academics and veterans organizations have been calling for the change of the celebration date, saying the exact date of establishment falls on April 11. “Respecting the proposal from the academic circles, the government has decided to change the date of establishment of the provisional government from April 13 to April 11, the date the provisional government decided the name of the country, declared the Provisional Charter of the Republic of Korea, and established the political system,” Prime Minister Lee Nak-yon said Friday at a ceremony marking the 99th anniversary of the provisional government’s founding in Shanghai, which was held at the Kim Koo Museum and Library. The Ministry of Patriots & Veterans Affairs last year commissioned a policy research titled “Reasonable Ways of Determining the Date of the Provisional Government’s Establishment” and checked the concrete facts and collected opinions from the academia. As a result, the ministry has concluded that there is lack of grounds to see April 13 as the date of the provisional government’s founding and it is safe to assume the foundation date falls on April 11 based on historical facts. The ministry says it plans to request the relevant ministries to revise Regulations on Various Anniversaries under a presidential decree within this month to change the date of the provisional government’s establishment.